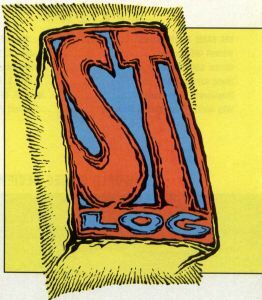 It's now been about three years since ST-Log came into existence, and over two years since it was separated from the pages of ANALOG Computing as its own monthly magazine. When we first started ST-Log, we were concerned over what type of magazine it ought to be. Should we model it after the already successful ANALOG Computing? Or should we look for a different direction? How similar were ST owners to their 8-bit-owning counterparts? After much pondering, we decided that ST-Log should start fresh, with its own direction. What worked for ANALOG Computing couldn't be expected to work for a magazine aimed at a new generation of Atari owners. The STs were (and are) very different machines from the Atari 8-bit computer line, and so it's logical to conclude that the people who buy STs are also different from the people who buy 130XEs. One major issue was whether ST-Log should include program listings. We knew we wanted to offer software, but because of the more complex operating system on the ST, programs were bound to be much larger—a great many of them so large as to be impossible to publish in the pages of a magazine. On the other hand, neither did we want to end up with a magazine that was disk dependent. Many people are not able or willing to spend $12.95 for a magazine We wanted to give our readers a publication that was worth its cover price even without the accompanying disk. So we concentrated on pulling together the best articles and columns we could. We focused our efforts on presenting quality information, including timely news, credible reviews and helpful tutorials. We centered the magazine less on the programmer and more on the average user, feeling that the majority of people who were purchasing STs were not interested in programming; they wanted a reasonably priced home computer that they could use. They were attracted to the ST because of the clever GEM operating system, which offered them ease of use at a remarkable price. Because people wanted to use their machines, however, the issue of magazine programs remained. Obviously, ST owners needed software if they were to fully utilize their computers. It had always been a focus of ANALOG Computing to supply 8-bit owners with programs for their machines. Should ST-Log do the same? Or should we not include programs at all? After careful consideration, we decided that we would not turn away any program that we felt deserved publication. When we could include the program listing in the magazine, we would; when that was impossible, we would distribute the program via disk and the ST-Log Atari users' group on DELPHI. But regardless, ST-Log was to be an information magazine, not an extended software manual, which meant limiting the number of programs in each issue. We think we've been successful in bringing you a quality, well-balanced magazine. Most of the comments we've received indicate that we've managed to please most of the readers most of the time, and that's really all a magazine can reasonably hope to do. However, there may be some improvements we could make, some areas that need more attention and others that need less. We wonder exactly what our readers think. That's why we've put together the short questionnaire you will find in this issue. Because ST-Log is your magazine, we of course need to know what you want. Please take the time to fill out the survey, and send it in to us. We fully expect to find that ST-Log already provides you with the material you need to get the most from your ST. (Why else would we be selling so many magazines?) Still, the response to the survey will help us fine-tune ST-Log and bring it closer to that always difficult to attain ideal. And that will make us all happy.